Helping consumers identify the impressive display capabilities offered by these models, Epson has grouped its high-end visual technologies under the umbrella term PRO UHD. To deliver exceptional image quality, these PRO UHD projectors offer a high dynamic contrast ratio up to 1,200,000:1, 4K-enhancement technology, 3LCD technology, Full HD, UHD BD and HDR support. Building on the success of the previous models, the enhanced EH-TW9400/W are capable of handling all 4K input devices. Every feature adds real value to the PRO UHD experience. 3LCD technology means users avoid the 'rainbow effect' and enjoy vivid colours thanks to an equally high White and Colour Light Output of up to 2,600 lumens. HDR support reveals extra detail and depth, giving natural yet richer colours. The ultra-wide colour gamut increases the range of lifelike colour, while the high contrast ratio of up to 1,200,000:1 delivers deep blacks for defined detail in the shadows. Even in the fastest action scenes frame interpolation and Detail Enhancement ensure motion pictures are sharp and smooth. 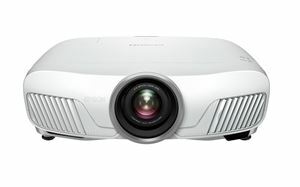 While the technology might be complex and precise, the projectors are incredibly straightforward to set up. The motorised optics include a powered 2.1x optical zoom, powered focus and powered lens shift. They’re designed for regular use with an incredibly long lamp life that means the user could watch a movie every day on the big screen for the next seven years, without needing a lamp replacement. Installers can experience these new, state-of-the-art projectors for themselves by visiting the AWE Smart Home Expo on 10th and 11th October at the company’s HQ and showroom in Epsom, Surrey.